Don't Like Going To The Gym? Try The Hula Hoop Hoopla!Berlin was established by Canadian Balazs Ari, a former mountain bike racer, and his girlfriend six years ago. They teach weekly classes of the "hoop-dance," a freestyle hooping exercise that starts on the waist and then moves up and down the body. Balazs Ari, a former mountain bike racer from Canada, has made a career out of what many people fondly remember as "hula hooping." Balazs Ari demonstrates Hoopla!Berlin, a freestyle hooping exercise that starts on the waist and then moves up and down the body. "It's something like yoga but faster. It's one way of saying it. It's like Pilates without all the equipment. It's like riding a bike with a smaller circle, if you wanna do it for exercise," Ari says. Hoopla!Berlin was established by Ari and his girlfriend, Rachel Catton, six years ago. They teach "hoop-dance," which is much more involved than simply spinning a hoop around your waist. "Basically, it started with one hoop," Ari says. "My girlfriend had this hoop at home, and after five minutes, I started sweating. I figured this could be good exercise. I don't like going to the gym. Then we started to look into it, and we realized, in California, it's been a trend since the early nineties. Well, it's a trend. There are so many moves. We started to experiment and to practice, and it took about a year to build up the courage to actually start doing classes." Most of the people who attend their weekly classes are between the ages of 20 and 40. "We call it freestyle hooping. What this means- you start on the waist, everyone starts on the waist, but that gets boring after 15 minutes. So what we do, we actually handle the hoop. We move it up and down the body. We take it in the hands, pass it around the body. We spin on vertical plain not just the horizontal plain. There is lots and lots to do with it. At the moment, we teach about 200 moves." Britta Poppe is a Hoopla!Berlin regular. 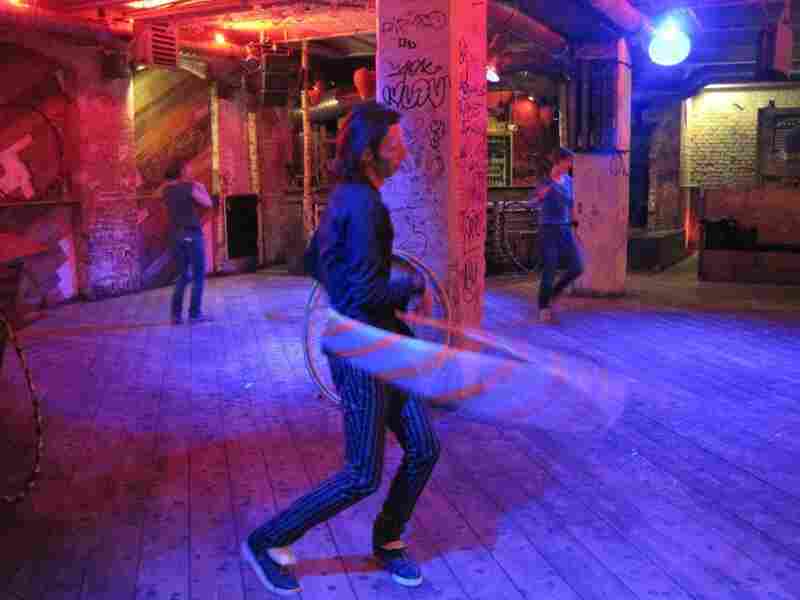 Once a week, she joins their "hoop-dance" class at Kater Holzig, a club near Jannowitzbruecke. She says she can tune out all her problems. It's a bit like meditation but also a great work out. "It's really good for toning the body because all these lower muscles, the deeper muscles are trained. You have to change your equilibrium every second, so it's really good for toning the body. Poppe started hooping eight months ago. She bought a collapsible adult hoop, hand-made by Hoopla!Berlin, and she keeps buying them as gifts for friends. She even bought one for her mom. The Berliner admits she is hooked. "I do it every day in my flat. I don't have any furniture in my living room. It's only my bed and nothing else. I really never get frustrated. I don't know why. Normally I get frustrated very easily but not with the hoop." Beyond the plastic toy that became mass-produced in the 1950's, the Hula Hoop, in one form or another, has been a part of various cultures for some time. "There is one famous photo, I believe, from Greece," Ari says. "There is a man with a hoop, and he is holding a bird. Hoop, man, bird. Other than that, the African tribes have been doing it. The Egyptians have been doing it for fitness to keep themselves beautiful." To see what Balazs Ari and his group can do with a hoop, you can check them out at the upcoming Carnival of Cultures.